The hit Netflix series Stranger Things was clearly influenced by Steven Spielberg and Stephen King, with a heaping helping of The X-Files and Twin Peaks thrown in for good measure. But some of its creepiest source material comes from the real world. 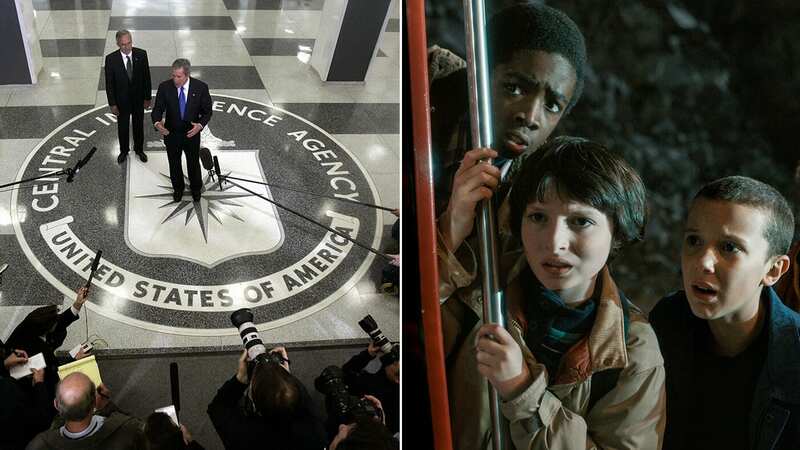 Past the plot points about the Upside-Down and the slime monsters among us are references to government mind-control programs and covert experiments in telepathy that actually took place in the U.S. throughout the 20th century – like MKUltra and Stargate Project. But which elements are more fact than fiction? Here are five examples from the show that had real-life equivalents – some of them freaky enough to make monsters look like an appealing alternative. Obviously spoilers abound, so come back later if you’re not done with the show yet. When Chief Hopper tracks down Terry Ives, the woman who attempted to sue the government for abuse after what happened to her at Hawkins, he and Ives’ sister talk about “Project MKUltra.” Though it sounds like what conspiracy theorists’ wet dreams are made of, MKUltra was a real government program funded by the CIA that went on from the 1950s to the early 1970s. It tested countless subjects at over 80 institutions, many of which were fronts funded by the government and filtered to schools, private hospitals and even a couple jails. Most of the documents relating to the project were destroyed by the CIA in 1973 because of course they were, but what we know comes from witness testimony, a couple congressional investigations and a cache of 20,000 incorrectly-filed budgetary documents found during a Freedom of Information Act request in 1977. It’s enough to paint a terrifying picture of a wide-ranging government project that sought to capitalize on mind-control techniques that could, theoretically, be used against enemies during the Cold War. When not being used to coerce testimony out of suspected terrorists at government black sites, sensory deprivation can be a relaxing and meditative experience probably happening at a spa near you. In Stranger Things, sensory deprivation tanks are used to trigger Eleven’s powers to help her listen in on far-away conversations and sneak up on the monster from the Upside Down. In real life, they mostly trigger hallucinations. First invented in the 1950s by neuroscientist and dolphin enthusiast John C. Lilly, the isolation tank (like the saltwater kiddie pool seen on the show) was developed as a means of sensory deprivation. Lilly was nice enough to test it on himself first, but sensory deprivation didn’t stay nice for long. While working on a subproject of MKUltra, psychiatrist Dr. Donald Ewen Cameron used a combination of hallucinatory drugs like LSD, electroshock therapy and sensory deprivation on unwitting patients, many of whom came in for things as innocuous as anxiety treatment. Though it’s not clear whether he was using a tank or some other form of sensory deprivation – like earplugs and blindfolds – some of the patients who underwent his experiments ended up permanently comatose. That hasn’t stopped sensory deprivation’s proliferation or use by the government, nor has the long-standing debate over whether it constitutes torture. There’s no evidence to suggest MKUltra experiments were actually performed on kids, but Cathy O’Brien sure thinks they were. O’Brien has written two books about her experiences in a government-funded program called Project Monarch, which involved testing mind-control techniques on children. According to the project’s truthers (of which there are quite a few), the government’s goal in recruiting children for mind-control experiments was to hopefully create the perfect super-soldier – which sounds a lot like Stranger Things, actually. There are also claims that it involved child sexual abuse and experiments based on the work of Heinrich Himmler during the Third Reich. Again, there is absolutely no evidence that Project Monarch existed but theconspiracy-minded among us still want to believe. Sure, Project MKUltra gets the shout-out in Stranger Things, but the tests on Eleven’s abilities actually seem to hearken back to something called Stargate Project. After all, MKUltra was supposedly over by the 1983 setting of the show, but Stargate was just getting warmed up. Funded by the U.S. Army, the project aimed to research paranormal phenomena that could be of use to the military, including but not limited to psychokinesis, mind-reading, and “remote viewings” of events and conversations – like when Eleven listens in on a Russian man’s conversation. The government even hired a psychic headhunter to recruit candidates. The 2004 book-turned-movie The Men Who Stare at Goats is about the Stargate experiments that tested telekinetic ability by having men do just what the title suggests in an attempt to kill the animals with their mind. Eleven is part of a similar experiment at Hawkins Lab when she’s asked to kill a cat by staring it, though that’s much less funny than goats for some reason. The government researchers of Hawkins rack up quite a body count in Stranger Things(#JusticeForBarb), but there was a death toll in real-life too. The most famous case of an MKUltra-related death is that of Frank Olson. In 1953, Olson was a biochemist at a lab that was conducting LSD experiments for the government. The government’s account that he knowingly ingested the drug is contest by his family, but either way, a short time after he partook in one experiment, he quit his job in the government, checked into a thirteenth-floor New York City hotel room and fell to his death from the window. The official government report suggests that Olson knew he was taking the LSD and it exacerbated his nascent suicidal tendencies, but his family maintained that he was murdered for knowing too much. They received a $750,000 settlement from the government in 1975. Then, in 1994, his body was exhumed and a coroner noticed head injuries that suggested Olson had been knocked unconscious before his death. The medical examiner thought his injuries were consistent with a homicide and the family sued for wrongful death in 2012, but a judge later dismissed it.